Hi, I've been told there are UFOs and Aliens being seen around Pause Dream Enjoy. Well, I was up in my Scrappin' room when all of a sudden look what appeared.!!!! Well, he's saying peace, so that's not too scary, but wait, there's more, check out all the little eyes peeping out the windows!!!! Hope they're friendly too. Now, the animal, oh, not too sure of "whatever it is" he looks like he's ready to attack!!!!! Well, that's all I have for today, I'm getting out of here!! Check over at Pause Dream Enjoy because I heard they have more aliens, creatures, spaceships and more. Our generous sponsor this week is Clear Dollar Stamps and they are giving away a $5 gift certificate to their store!! So get your creation posted so maybe you can be the next Winner!! They have some awesome stamps and also a SALE going on now. I hope I made you chuckle or put a smile on your face, if so, that's what I intended to do and my job is complete. 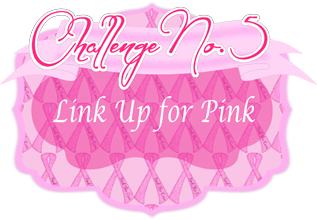 Challenge #5 started Aug. 23rd and there are lots of fabby prizes to be won and so join in and support Breast Care Awareness. Hope to see you there!! hahaha!!! 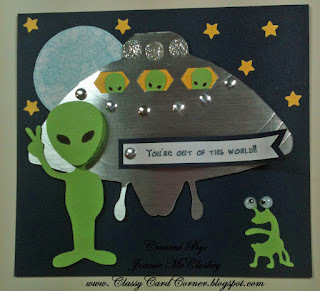 What a cool alien card!!!! !